The Vespa 150 TAP was an anti-tank scooter made in the 1950s from a Vespa scooter for use with French paratroops (troupes aéroportées, TAP). Introduced in 1956 and updated in 1959, the scooter was produced by Ateliers de Construction de Motocycles et Automobiles (ACMA), the licensed assembler of Vespas in France at the time. 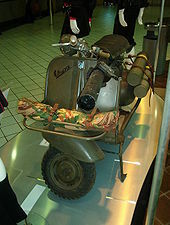 Modifications from the civilian Vespa included a reinforced frame and a three-inch recoilless rifle mounted to the scooter. The 150 TAPs mounted a M20 75 mm recoilless rifle, a U.S.-made light anti-armour cannon. It was very light in comparison to a standard 75 mm cannon but was still able to penetrate 100 mm of armour with its HEAT warhead. The recoil was counteracted by venting propellant gases out the rear of the weapon which eliminated the need for a mechanical recoil system or heavy mounts, enabling the weapon to be fired from the Vespa frame. The scooters would be parachute-dropped in pairs, accompanied by a two-man team. The gun was carried on one scooter, while the ammunition was loaded on the other. Due to the lack of any kind of aiming devices the recoilless rifle was never designed to be fired from the scooter; the gun was mounted on a M1917 Browning machine gun tripod, which was also carried by the scooter, before being fired. However, in an emergency it could be fired while in the frame, and while the scooter was moving. Wikimedia Commons has media related to Vespa 150 TAP. Bull, Stephen (2004). Encyclopedia of Military Technology and Innovation. Westport, CT USA: Greenwood Press. p. 283. ISBN 1-57356-557-1. LCCN 2004040431. Retrieved 2013-06-09. Surely one of the oddest military vehicles, the Vespa "Scooter, Motor, 2-Wheel, Airborne" was in use by French paratroops from 1957. Weighing 90 kg and powered by a single-cylinder 146 cc two-stroke engine, it was fitted to carry a recoilless rifle. Sarti, Giorgio (2006). "Part three THE VESPA FAMILY". Vespa: 1946-2006: 60 Years of the Vespa. St. Paul, MN USA: Giorgio Nada Editore / MBI Publishing. p. 152. ISBN 0-7603-2577-4. Retrieved 2013-06-09. Designated as the TAP 56 and revised in 1959 as the TAP 59 (TAP standing for Troupes Aéro Portées), the military Vespa was finished in a typical dark olive green only and was produced exclusively in France.